Our Royale Sash Window incorporates the traditional styling of wooden box sash windows with the advantages of a thermally broken aluminium profile. Suitable for use in heritage and conservation areas, or where Georgian and Victorian architecture is predominate. 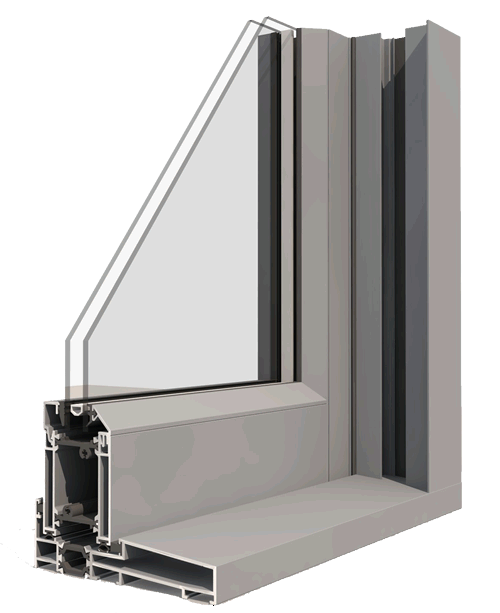 Easy to operate, these Vertical Sliders are suitable for use in high occupancy buildings. The Royale Sash Window comes with authentic hardware and features a ‘tilt in‘ operation, which allows the cleaning of the external glass. Featuring sash horns and a choice of authentic glazing and deep bottom rail options - this sash window retains the charm of any period property. Suitable for Georgian and Victorian architecture, with an optional 95mm deep bottom rail for traditional installations. Choice of flush square cill or sloped projection cill, and standard or slim jamb section. Authentic locking catches (x2 over 1000mm) - available in a variety of colours. Fitter friendly 130mm front to back thickness with a double polyamide thermal break. Compliant to Doc L of the Building Regulations - can achieve a Window Energy Rating 'B'. Internally beaded sashes - with 18mm krypton gas filled double glazed sealed units. Both sashes can tilt-in - for easy access to external glass for cleaning.